Headwaters Farm is the site of the District’s exciting Headwaters Incubator Program, which seeks to aid the development of new farm businesses by providing affordable access to land and farm resources. 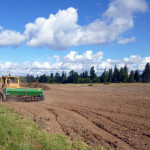 The 60-acre property on the outskirts of Gresham is owned and managed by EMSWCD. Learn more about the program here! Want to learn more about the Farm Incubator Program? Get in touch with us to schedule a tour! 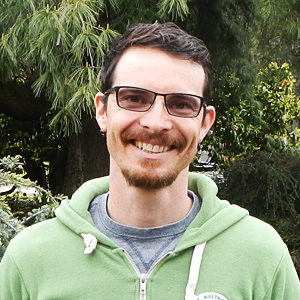 Contact Rowan Steele at rowan@emswcd.org or (503) 939-0314. In addition to making land available to start-up farm businesses, the Headwaters Farm also contains 15 acres of area lining the North Fork of Johnson Creek, which has been put into our StreamCare program to conserve and improve soil and water quality. This interface between active agricultural production and vibrant natural environments is a critical component of Headwaters Farm. In order to ensure that agriculture and the surrounding environment can both thrive, Headwaters Farm also serves as a site for research and demonstration of conservation agriculture practices and stewardship. Check out our new video about Headwaters Farm! Sudan Grass was used on over 20 acres to help suppress thistle and to add large volumes of organic matter. Crimson cover was undersown in seven acres below the Sudan Grass to fix nitrogen and hold soil throughout the winter, after the Sudan Grass was winter-killed. Vetch and rye were planted together over 30 acres as a winter cover crop that builds soil by fixing nitrogen and adding large amounts of organic matter. 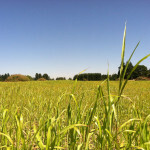 Want to know more about cover cropping? Visit our resources section for useful guides, calculators and worksheets! 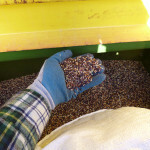 In addition to using cover crops as a prominent way to build and manage soil fertility, all incubator farmers are required to take soil samples of their plot at the end of each season and work that information into a Nutrient Management Plan. Under the direction of OSU Extension Service or EMSWCD soil fertility experts, farmers develop a plan for ensuring good soil fertility without adding unnecessary amendments or overusing fertilizer that could end up in water ways. The location and timing of fertilizer application also plays a big part of soil fertility in conservation agriculture practices. 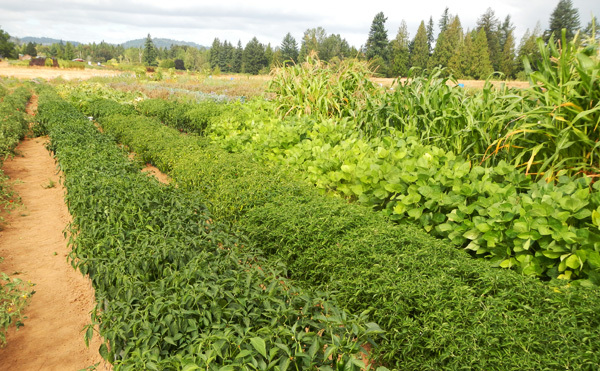 Farmers are strongly encouraged to use drip irrigation at Headwaters Farm. In fact, if a farmer purchases their own drip system, then their water is free. If a farmer needs to use overhead irrigation, then there is a charge for that water use. 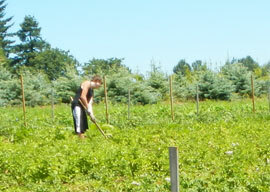 Currently, all incubator farmers at Headwaters use drip irrigation. Our crawler tractor in operation. The primary tractor for fieldwork at Headwaters Farm is a “crawler,” meaning that instead of tires, this tractor has treads. This allows the weight of the machine to be spread out over a larger service area, reducing soil compaction and soil disturbance. An added benefit to a crawler-style tractor is that it has greater power and efficiency. While there is a rototiller at Headwaters Farm, another implement, the Schmeiser Till An’ Bedder, can create finished seed beds without overworking the soil or mixing horizons. Using implements like this disturbs the soil less and does not create hardpan. The primary cultivation tool currently in use is a disk. Farm and field layout can have a big impact on keeping topsoil in place and ensuring that sediment stays out of waterways. The most vulnerable natural resource at Headwaters Farm is the North Fork of Johnson Creek. To protect water quality, a buffer has been put around the creek, where no agriculture takes place. Instead, this buffer is being restored through EMSWCD’s StreamCare program, which removes invasive species, plants native plants, and then maintains the site for years to come. In order to encourage healthy soil life, protect pollinator species and other beneficial insects, as well as to improve economic outcomes, incubator farmers are required to use organic practices at Headwaters Farm. In lieu of pesticides, farmers have a myriad of cultivation tools at their disposal: hand and wheel hoes, a flame weeder, walk-behind tillers, and full scale tractor implements. In addition, farmers are encouraged to use biodegradable mulches though bulk purchases of these products. 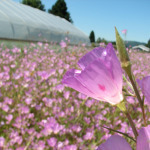 In partnership with The Xerces Society, pollinator strips continue to be developed at Headwaters Farm, through a technique called solarization. Solarization uses passive solar energy to heat the soil to temperatures that kill invasive weeds and their seeds, while setting up wonderful conditions for propagating beneficial pollinator plants! In the area pictured here, the pollinator strip cycles through several stages of different flowering plants, each providing food and habitat to pollinators such as bees throughout the year. Learn more about supporting pollinators on the farm. 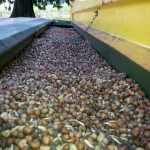 Questions about Headwaters Farm? Contact Rowan! ¹Dumanski, J., R. Peiretti, J. Benetis, D. McGarry, and C. Pieri. 2006. The paradigm of conservation tillage. Proc. World Assoc. Soil and Water Conserv., P1: 58-64. Apply for the Headwaters Incubator Program! Check out this section for everything you need to know!